I thought I post this because I never see anybody using this inexpensive tool . The French curve is one drawing instrument that has many uses in the shop and I could not do without them and it sure beats drawing a curve free hand or using things like a roll of tape or bent stick ETC. to arrive at a desired curved shape. 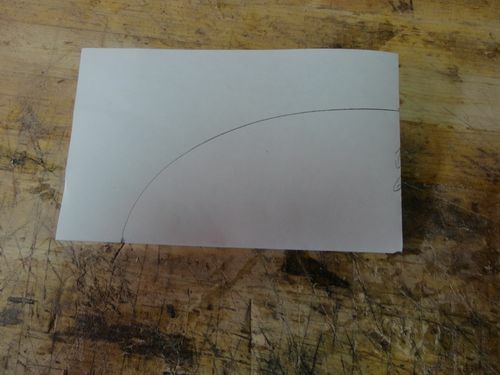 A friend called this morning asking if I new how to draw an oval and I said just come over and I show you the easy way . When he arrived I ask him if he had a set of french curves and he looked at me and said what is that . Off to the shop we went and I showed him the set of French curves and said this is what you use . 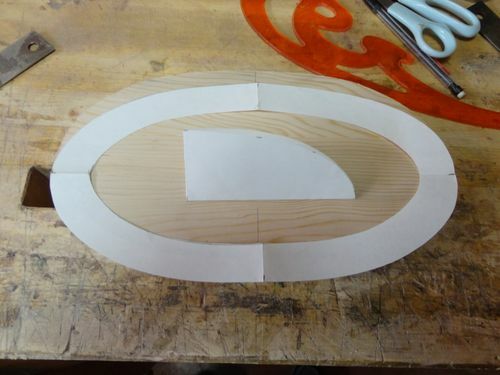 The oval he needed is for a box bottom and it has to have a nice shape . Anyway this is how I draw an oval . 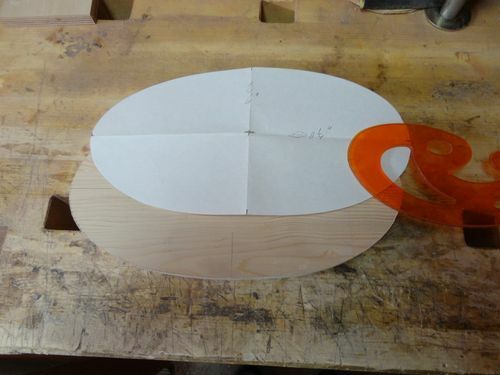 Lay the french curve on the paper touching the marks and slide to the desired shape and draw a pencil line and now with the paper folded up cut along the line and unfold the paper . 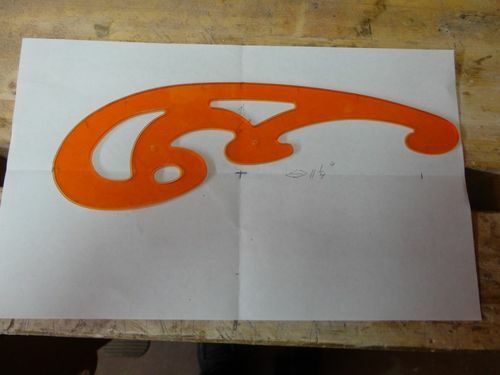 Here are the two pieces we cut out on the bandsaw and cleaned up a bit with a file and note the centre line marks on the pattern and workpiece which can be helpful later for accurate reference . 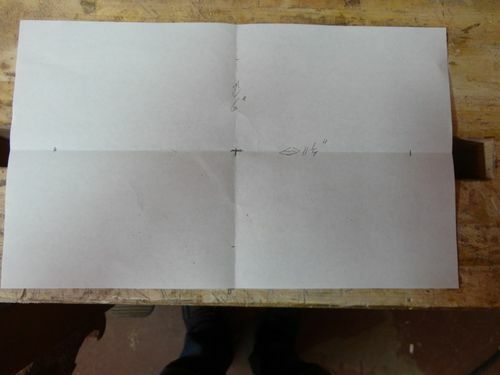 For the inside the same process can be done by marking several dots a certain distance from the edge close to perpendicular and connecting the dots .With a little tweeking and you should have a nice parrallel line and that would make a nice picture or mirror frame . There is the oval quick and easy and no compass or any fancy geometry required and you only need to draw a quarter of the oval . Keep the pattern it may have use down the road for another project . I hope this helps someone . Thanks for sharing the tip. I agree with you that french curves are very useful. I have a set in my shop as well. Indeed. Now the Neanderthalers don’t need a computer. ;) Then again, ellipse tools have been around for millenia. I have a lot of old drafting equipment. No sliding T-square, but the table for it. I think I have every size of the French curves, also have 45-45-90 and 30-60-90 triangles in a few sizes. Compasses, etc., I even have some antique slide rules. That’s what we used back in the day in the US Navy. I don’t have one of these but after seeing this, it is now on my BUY NOW list. Thanks for the lesson…..I learned a new trick today! I’ve used my French curve templates to draw curves, arches, etc…but I never knew this. What a great tip! Nice write up on using a French curve. As a old timer, I forget people didn’t grow up drafting the old fashion way. A definite handy tool for many uses. I have a set I bought at Office Depot and frequently use them. This is in my tool kit as well. Bought some new ones as the old ones were broken. I have that curve but never used it for an oval. That is a very handy trick. I always learn something when I watch your posts. I have a few sets of these french curve sets. They are life and time savers. 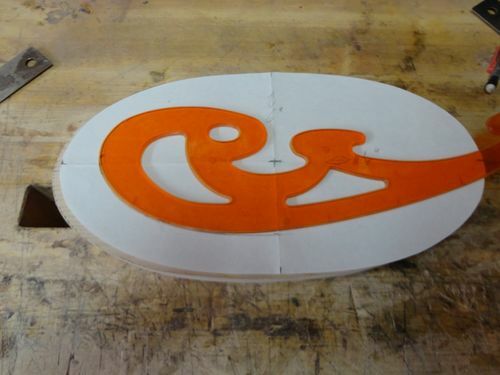 great for use on trim work also. 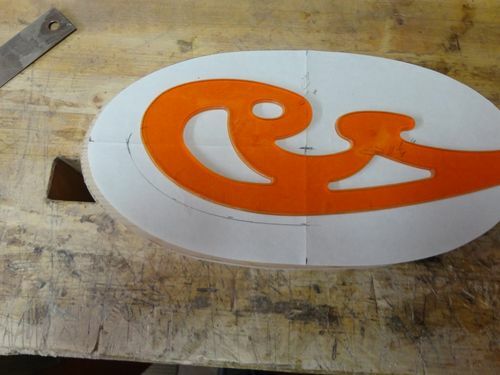 It’s so easy to change the radius with a turn of curve. Thanks for posting Klaus. Hope others can get great results with these. I have a French curve but never used it for an oval. These are really useful pieces of kit to have around when you need an elegant curve on a a project. A must have in the tool draw. 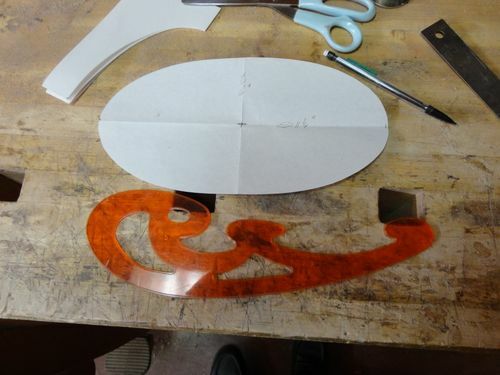 I have a French curve Klaus, but have never used it to make an oval. Thanks for the lesson. That is neat Klaus. I have not tried to complete an oval with them. I have three french curves: Gigi, Fifi and Monique and I use them all the time for matching curves to radii to make an appealing look.